Winterial 6-7 Person Teepee Tent is for 3-season camping, a single-pole non-freestanding structure with solid windows and two doors, and with a great price tag. Classic design with modern materials. This tent is available on Amazon, and the price is almost the same as on the manufacturer’s site. As you realize from the picture this is a teepee or tipi as it is also written, a classic stricture with a single pole in the center. It is necessary to stake it down properly so it is not freestanding, but this is typical for such modern tipis. Note also that this is a single-layer structure and it is very tall with 8 ft (244 cm) peak height, so I have added it to my list of very tall tents. 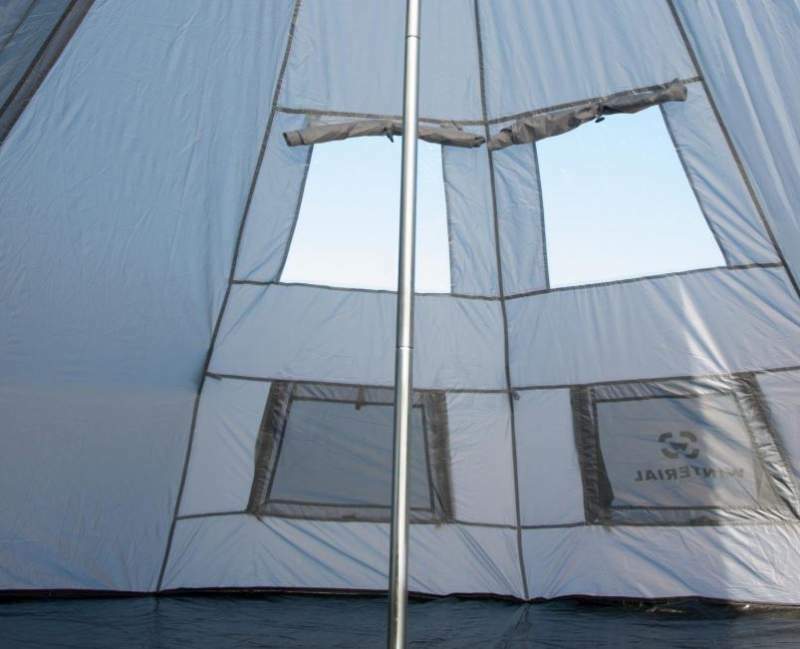 I know that some people find the pole in the center a bit annoying, see the picture below, but this is a part of this design, and this also makes the setup easy, one person can easily make this tent ready in several minutes. Start by unfolding it and staking the perimeter. After that take the pole in place and raise the tent. Then adjust the guy out-lines. You have around 30 stakes in the package, some used for the tent’s base and some for the guy-out lines. Inner view with 2 out of 4 windows and 2 out of 4 vents. Regarding the capacity, the declared number is 6 – 7 people. 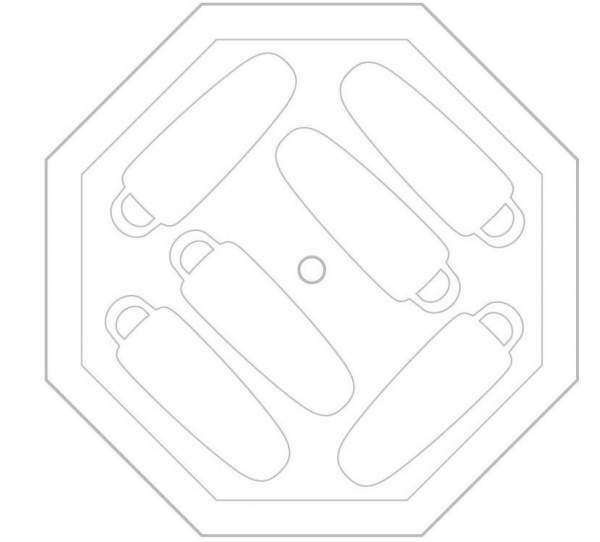 Now, this is an octagonal structure shown in the picture below, they do not provide the exact number for the floor area but it should be around 119 ft² (11 m²). In the case of 6 users, as the picture below shows, this gives 19.8 ft² (1.8 m²) per person. This looks enough, but note that there are no vestibules for boots, shoes, and other stuff. On the other hand, the wall is angled inwards and this in particular close to the ground, so the actual volume is smaller than what you would expect. So make it 4 users and you will have quite enough space. This is how 6 people can use the floor for sleeping. Regarding the weight, with its 15 lb (6.8 kg), this is quite a lightweight item. If you check its packed size which is excellent 23 x 9 x 9 inches (58 x 23 x 23 cm), this looks like an item that could be carried on some shorter hiking tours. But all in all, this is a camping item and you can transport it even on a bicycle. Seasons-wise and climate-wise, I see this teepee as s nice 3-season shelter. The roof is steep and the waterproof rating is good enough, but this is a single-layer structure and the walls are angled so whatever touches them will become wet due to condensation. On the other hand, in a cold environment, you can close the vents and keep the warmth inside. Note also that the windows are of a solid material. So it might be better suited for a cooler environment because it has no large mesh openings which you need in a warm climate. There are vents of course and the mesh on the doors, but the doors must be closed when it is raining, and this can be a problem if it continues for hours. As mentioned above, this is a very tall structure and although there are plenty of guy-out lines, I would not use it in very windy areas, definitely not above the tree line. 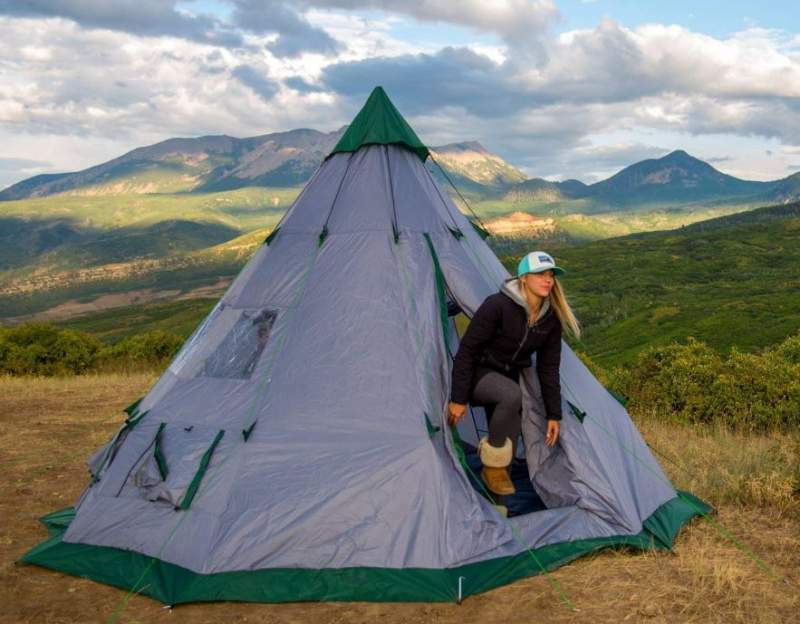 Nevertheless, I have added this tent to my list with best teepee tents for camping. The shell fabric is 210T polyester with the waterproof rating of 1500 mm. In view of its steep roof, this is more than enough even in the case of snow. The floor is a tarpaulin bathtub style and with the same waterproof rating, and this is not so impressive for the floor material. There are two doors here which are double layer structures with mesh and panel. The size is 5 feet wide and 5 feet 10 inches tall. You also have 4 translucent windows made of a rubberized plastic, and their size is 20 x 20 inches (51 x 51 cm). They are also equipped with blinds from inside. There are 4 large vents on the sides, plus a top vent, and they can create enough air circulation. This can be further improved when the sky is clear by keeping only the mesh on the doors. You will need this to fight condensation. There is a plastic stabilizer to protect the floor. 30 Ground stakes in the package. 1 Thick and sturdy aluminum pole. No mesh on the top vent. Dimensions (D x H): 12 x 8 ft (366 x 244 cm). Area: 119 ft² (11 m²). Area per person (for 7 people): 17 ft² (1.57 m²). Area per person (for 6 people): 19.8 ft² (1.8 m²). Packed size: 23 x 9 x 9 in (58 x 23 x 23 cm). In the summary of this Winterial 6-7 Person Teepee Tent review, I wish to stress again that this is a fully enclosed design but still with numerous venting options. This makes it very versatile, though perhaps better suited for a cooler climate. If you need something smaller, please check this Wenzel 5 person teepee tent and also this Guide Gear Teepee Tent 18 x 18. If you would rather have something different check this Wenzel Blue Ridge 7 tent which is a tunnel-shape tent. Note that this is not a sponsored text and I have no relation with the brand. Do you have any experience with this teepee? If so please share your thoughts, there is a comment box below.